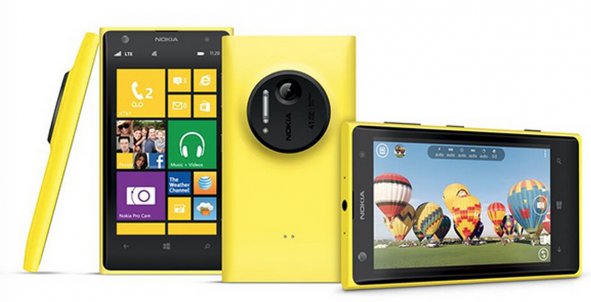 Nokia Lumia 1020 with 41 MP camera and 1.5 GHz Dual Core Officially Launched in New York. Nokia has officially launched Nokia Lumia 1020 and all the leaked specifications that we covered earlier, match the official one. This new flagship device was awaited by many users and promises to take windows phone experience to the next level. The most highlighted feature of this new Lumia phone is its Spectacular 41MP camera. This Windows phone 8 device is powered by a Dual core Snapdragon S4 processor clocked at a frequency of 1.5 GHz with Adreno225 GPU. This is also the First Lumia device to feature a 2 GB RAM. Internal storage of this device is 32 GB but it doesn’t come with a memory expansion slot. For most users this will be more than enough storage capacity. This device has a 4.5 Inch AMOLED WXGA (1280 X768) 2.5D display. Like traditional Nokia clear black displays this device will give you very good outdoor visibility by reducing the amount of light reflected from your screen and thus also increasing brightness. This super sensitive touch, PureMotion HD+ screen is protected by corning gorilla glass 3 thus making it extremely resistant to abuse. Let’s now talk about the marvelous PureView, Camera with 6 element lens, of this flagship device. This 41 MP camera comes with Xenon Flash for still images and LED flash for video with Optical image stabilization. This camera uses a new feature called Dual capture it simultaneously captures 38 MP images along with a 5MP image. You can use the smaller image to share it with friends. A third party camera application, Nokia Pro Cam that comes preinstalled with device. This application allows you to change various settings while clicking images. The shutter speed range is similar to that provided by DSLRs ranging from 4 sec to 1/ 6000 of a second. This new Nokia device poses venerable specifications and is available in white, black and yellow. Even with the whooping 41 MP camera the looks and design have succeeded In giving it more of a Smartphone look rather than a DSLR camera, like in Samsung Galaxy S4 Zoom which weighs 208 gram.